Do you remember the 21st night of September? This single line alone surely harks back to a lot of great memories for you and the whole gang, right?! Well, this is not the time just sit back and do a throwback to those good ol' days. You and your groovy pals have just to get up on your feet, 'coz it's time to dance! Save the date, pin the venue, and party on! 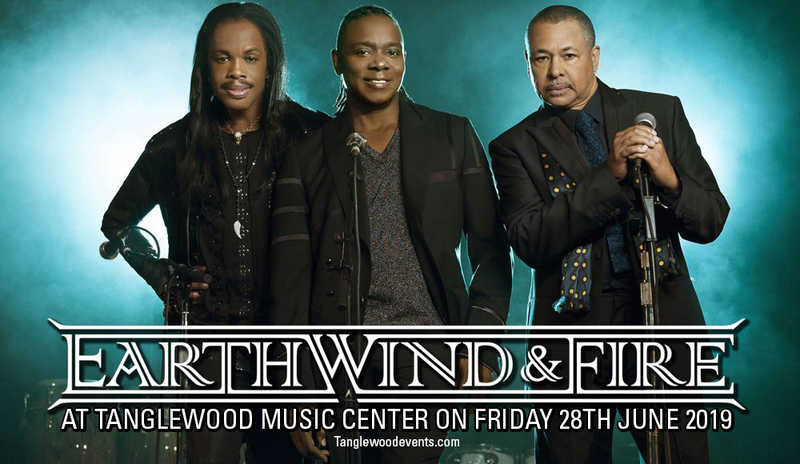 Earth, Wind And Fire will work up their sensational disco magic and transform the Tanglewood Music Center into a boogie wonderland, on Friday 28th June 2019. But first things first, better book your tickets real quick. Tickets are on sale now and get it with just a few easy clicks starting with the 'buy tickets' button. Get your tickets now! Earth. Wind. Fire. They're not just elements of nature that make life on this planet liveable. Earth, Wind And Fire has definitely made life in this world more enjoyable! The music of Earth, Wind And Fire always incite a sense of celebration. Hence, a concert season would certainly not be complete without Earth, Wind And Fire circling the globe and playing in various concert halls and stadiums. And yes, they've been on the concert circuit for well over four decades; and people of multi-generations haven't stopped dancing and partyin' with their R&B, jazz, disco, pop and funk-infused ditties. Earth, Wind And Fire is undeniably one of the most successful music artists in many aspects of their illustrious career. Their success amounts to over 100 million records sold, and still counting up to this day with the influx of music streams and downloads. They have been performing before sell out crowds in countless shows and venues literally in almost every part of the globe. Apart from commercial success, the band has scooped up several major awards in prestigious award-giving institutions like the Grammys. Earth, Wind And Fire has been inducted into the Vocal Group Hall of Fame, the Songwriters Hall of Fame, and the Rock and Roll Hall of Fame. They also been bestowed with a star on the famous Hollywood Walk of Fame. Most significant of all, Earth, Wind And Fire has brought the world of audiences up on their feet, has kept music fans singing and dancing and partying all these years with their timeless classic hits — "September", "Boogie Wonderland", "Fantasy", "After The Love Has Gone", "Shining Star", "Reasons", "Let's Groove", and many, many, more! No excuse to miss this one for the world. Go, get those tickets now!